Here are some photos from yesterday's "Hajichi" program. Thank everyone who joined the program! I just completed a draft of my MC's speech. I am so excited to host the "Hajichi" program tonight. It is unfortunate that we can accept limited audience for the show which will be hold at JAA facility. I have a special feeling for tonight's show, which is titled 'Hajichi,' meaning 'Tatoo' in the Okinawan language. on the back of a woman's hand were an expression of their status in traditional Okinawa. My late grandmother had such tattoos on her hands; I'm not sure I can watch Sumiko Kitajima's performance without crying. Well, I am the MC, so I won't cry. Hi, I went to see the FULL HOUSE tonight . There wasn't a FULL HOUSE on opening night, but I enjoyed the show very much. This was the first time I ever went to see Shinpa Geki. I enjoyed Taro Hanabusa's stage makeup scene very much, since the theater was small and I was sitting in the second row and his makeup table was set up in front of my seat. It was quite interesting to me, since I also offer a makeup program as part of my 90-minute lecture. Standing at the door of the theater on the way out afterward, I asked some other audience members how they liked the show. They said they enjoyed the makeup scene in particular. The program itself was about 80 minutes. Hanabusa performed a traditional dance with a fan! It was a funny and enjoyable show. Today is kimono lesson day for me. A theme of today's lesson is try to tie four different kinds of Obi on one kimono. I dressed in a dark-blue silk kimono called Iro Muji with Sagami Shishu (Embroidery). I was so impressed with Taikoza's performance tonight. There were only four female drummers and Marco Lienhard and a dancer. The special guest Ichiro Jishoya's drumming was very different in technique, and I enjoyed his drum performance very much. Surprisingly, Mr. Jishoya performed on the piano, too. Program No. 7 "Nostalgia" Piano + Shakuhachi song was unique to me. Marco after 25 years. They had last played together at Symphony Hall in Boston. however, Marco played a song called "Shima Uta" with his Shakuhachi instead. I did like Marco's arrangement of Shima Uta for the Shakuhachi. all of a sudden, he picks the Shakuhachi and plays! Taikoza's program was full of energy and fun. Here are some photos from tonight's Taikoza performance. that will be held this month! Mr. Taro Hanabusa, a Japanese Onnagata performer presents a comedy show. 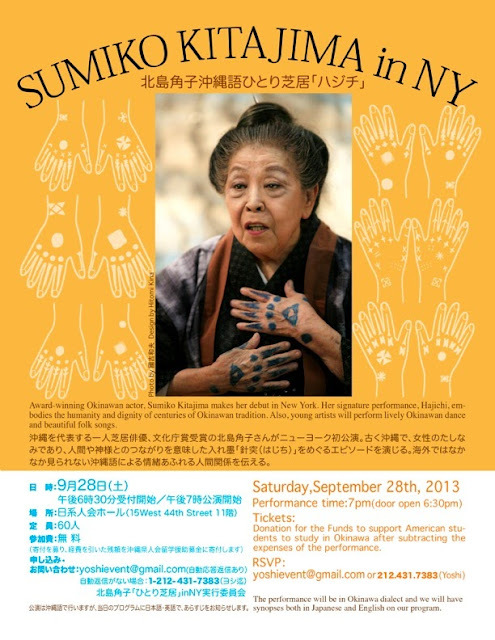 Okinawan actress presents a drama called "Hajichi"
I will be the host (MC) for the program, and hope to see you at JAA! We had a productive meeting. Fifth Avenue was so busy as usual. Here are photos of Fifth Avenue today. Kenichi Ebina moves on to the finals! I am so happy to see Kenichi Ebina appear on the Americas Got Talent TV program. Ebina performed at the Wang Center during the Long Island Sakura Matsuri twice over the last few years. I performed immediately after he did, so I was lucky enough to be able to watch his dance from off-stage. He is an amazing dancer, who moves in inhuman ways. He is an exciting choreographer who creates original characters. He is a professional showman who can offer what audiences enjoy. I voted for him on Tuesday night, the first time I have done such a thing. I created another bag with Nishijin Obi brocade, and will list the bag on my website soon! I highly recommend this bag. It is a time to change wardrobe from summer to fall. I am creating inventory list of my wardrobe. Kimono for fall season, ready to wear. I am working on my new bag this weekend and would like to introduce a new bag. This bag will be listed on my website and Etsy page soon!